Hank Newell, former head of Wausau Paper, blamed activist investor Jeffrey Smith for undermining a deal that could have saved the mill. 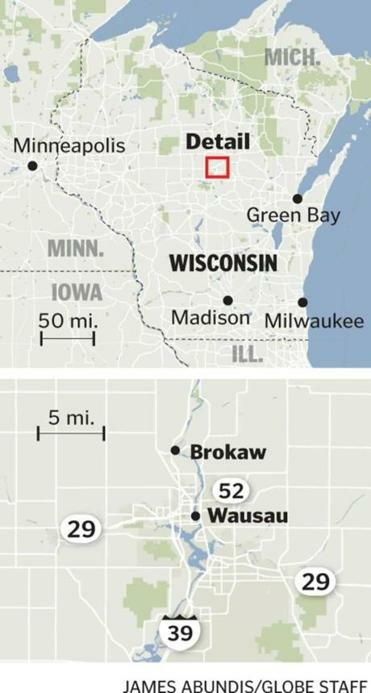 BROKAW, Wis. — For more than a century, this village on the banks of the Wisconsin River stood as a symbol of one way the American economy was built, a compact between a company and a community. Wausau Paper built the houses, stores, and even the Methodist church. 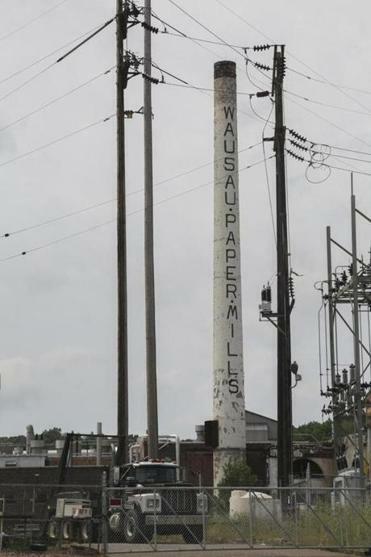 Hundreds of workers streamed down Everest Avenue to work at the mill, which hummed day and night, its signature smokestack looming over the landscape. But as a former Army artillery officer named Hank Newell prepared a few years ago to take over as Wausau Paper’s chief executive officer, he knew he faced a dilemma. The mill seemed prosperous, as workers produced a rainbow of colorful paper products at one of the largest such plants in the world. Yet the company needed to sell the mill as it reshuffled its priorities in a fast-digitizing world, and Newell wanted a buyer who would keep the place going. Otherwise, 450 people could lose their jobs and the village itself might go bankrupt. The negotiation to sell the plant was at a delicate stage, Newell said in an interview, when he received a letter that alarmed him from a New York City hedge fund called Starboard Value. 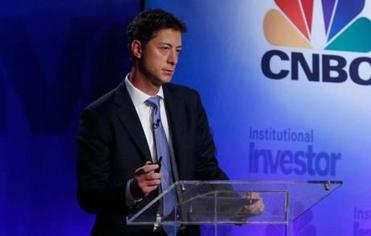 Newell soon learned that the fund’s chief executive officer, Jeffrey Smith, was part of a new breed known as “activist” investors, who scoop up a sizable portion of company shares and fight to boost the price. And Smith, even as he snapped up Wausau shares, was calling for big changes at the struggling firm. What followed was a clash of corporate cultures that is being played out across America, a Main Street versus Wall Street story with a powerful new twist provided by the growing clout of activists. It is a trend that could eventually affect the majority of publicly traded companies and tens of millions of workers. Activist investors scour reams of data about the nation’s publicly traded companies in search of targets. They look for firms that may have piles of extra cash, or that can be reshaped quickly. They often cast themselves as outsiders who can take a cold-blooded look at a firm’s finances, and push for steps that can boost a company’s stock price. Activists say they provide a valuable service by turning around poorly run companies, pressing for change, and forcing out ineffective executives. Critics of the practice, however, said that companies can be blindsided by high-flying investors whose main goal is to quickly profit from their stock position, regardless of the long-term impact on companies and communities. The Wausau Paper mill in the village of Brokaw, Wis., the world’s biggest producer of colored specialty paper, employed 450 people before it closed in 2012. The strategy has become one of Wall Street’s hottest trends. 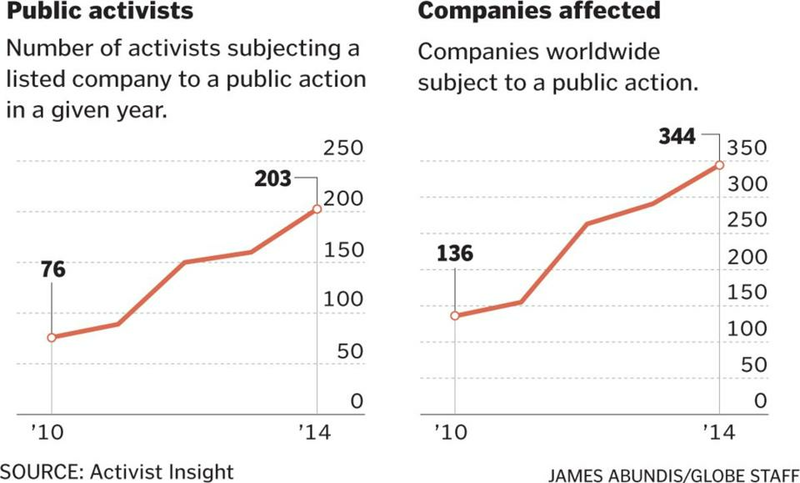 The number of major activist investors has tripled to 203 in the last four years, while the number of companies subjected to pressure from activists has jumped from 136 to 344 worldwide during that time, according to the publication Activist Insight. Such investors are having more success than ever, not just by pressuring companies to change, but also by winning in nearly three-quarters of proxy fights, which typically involve battles over board seats and thus sway over corporate strategy, according to Factset. All of this is starting to resonate in the presidential campaign. Democrat Hillary Rodham Clinton on July 24 blasted what she called “hit-and-run activists” during a New York City speech in which she proposed a series of restrictions on the practice. Newell, suddenly swept up into this new world of activism, hoped that he could persuade Smith to be patient. Lightning struck near Newell’s home on the Wisconsin River in March 2011 — a moment of peril that proved a personal turning point as well. Newell was hours away at the time. He was visiting a company plant in Kentucky that was central to his plan to remake Wausau Paper. He wanted to pour company resources into the plant to focus on products such as tissues and toilet paper, business lines holding up better in the digital age. His goal was to produce such products in an environmentally friendly way. As prosaic as the products seemed, they were the company’s future. In short order, Newell would receive a series of rude awakenings, first on the homefront, and then in his business world. The lightning strike near his house set off a chain reaction. Indirect lightning can travel through a nearby house’s wiring, knock out smoke detectors, and cause gas appliances to torch. Newell’s wife, Becky, was asleep as flames spread toward the bedroom. The Newell’s dog, Dolly, pawed Becky’s shoulder and awakened her. Feeling the heat from the other side of the bedroom door, she left it closed, scrambled to the first floor window and leapt out, her life saved by her dog and her quick wits. As Becky, who had been home alone, gathered herself, hearing the distant sirens gradually come closer, she soon saw volunteer firefighters leap from the trucks. She realized that a number of them were Wausau Paper mill workers who had left their own homes, risking their lives to save hers. Hearing of the dog’s heroics, a number of mill workers decided to donate to the local Humane Society in honor of Dolly, who survived the fire. As Becky later related her survival story to her husband, the couple saw it as confirmation of what they believed about how a community and its major employer should interact; it became for them a defining moment. Newell had long worked in the paper industry and knew that change, sometimes disruptive change, was a constant. But he also saw more clearly now that they were all part of a community, not just a company, and were in it together. That was the way Newell wanted to run the company, he said. Some of the mill workers had questioned whether Newell was just another drive-by executive, whether he really was committed to the small-town mills. He was. He would rebuild his house and stay at Wausau Paper for the long term – or so he thought — and try to preserve as many of the company’s jobs as possible. Two months later, another thunderbolt arrived, this time from Wall Street. Newell in June 2011 had had a cordial get-acquainted meeting with Smith but a month later the tone had changed. Smith, in a public letter, criticized what he called the “dismal performance” of the company’s paper business, the focus of the Brokaw mill, urging that Wausau get out of that product line. He also criticized Newell’s plan to invest $220 million to modernize a Kentucky plant that produced tissues, toilet paper, and towels. Smith’s criticism drew headlines across Wisconsin. “Wausau Paper shareholder concerned over lagging paper business,” said the headline in The Wausau Daily Herald on Sept. 11, 2011. No one disputes that there were concerns about the future of the Brokaw mill, given the shift in market trends. But Newell said the mill had years of useful life. He said that after Starboard’s criticism, the would-be buyer lowered its offer to an unacceptable price, and then a major customer of the mill went elsewhere. Smith, however, would later blame the problems on management failures by Newell and others. Either way, the mill was no longer sustainable. Word began to leak that the Brokaw mill would close. Jeffrey Weisenberger, like his father before him, had long worked at the sprawling paper mill here on the banks of the Wisconsin River, earning a good living. Growing up in Brokaw, Weisenberger said, was like being in “a touch of heaven,” with the company providing nearly all that was needed. Wausau Paper was founded here in 1899 by Norman H. Brokaw, for whom the village is named. Weisenberger had heard that a New York City-based hedge fund had started buying shares of Wausau Paper. He knew from his work as a union shop steward that the Brokaw mill was the world’s biggest producer of colored specialty paper, such as the brightly colored index cards for sale at Staples. He didn’t believe the mill was at risk. Then one day in 2011 he received a call on his cellphone, while he was at a funeral, that the mill would close. It fell to Newell, who was promoted from chief operating officer to chief executive in January 2012, to complete the closure of the Brokaw mill. It was in the end Wausau Paper’s decision — affirmed by Newell and the board of directors — not that of Smith or Starboard Value, which did not operate or control the firm or have insider access to corporate financials or strategic plans. But to this day, Newell believes the Brokaw mill could have remained open if it had not been for Starboard’s public criticism that he believes undermined his effort to sell the plant. Smith and his Starboard partner, Gavin Molinelli, who now sits on Wausau’s board, declined to speak on the record about Newell’s version of events. An activist investor allied with Smith said Starboard should be praised for trying to rescue the company and blamed Newell for the problems, but this investor also declined to speak on the record. Wausau Paper officials similarly declined to speak on the record and provided only a press release that confirmed the company had tried and failed to sell the Brokaw mill. The plant closed for good in early 2012. Then a Minnesota mill was closed, costing 134 jobs, which Newell said was a ripple effect of the failed Brokaw sale, but which Smith charged in another letter was another sign of bad management. The clash between Newell and Smith escalated in their public letters; Smith wrote that the company had a history of “failed commitments,” while Newell cosigned a letter that said Smith’s charges were “without any basis in fact.” Smith, meanwhile, used his leverage to get four Starboard-backed candidates on the nine-member board of directors. Newell’s control was becoming tenuous. Jeffrey Smith strode to a stage at New York City’s Time Warner Center on Sept. 17, 2013, and waxed rhapsodically to hedge fund managers and reporters about why investing in Wausau Paper would be so lucrative. Activist investor Jeffrey Smith publicly criticized the way Wausau Paper was being managed. Smith believed that the company, then worth about $650 million, could afford to allocate $100 million to buy back stock. In some cases, stock buybacks jack up the price because fewer shares are available. As the company’s single largest shareholder, holding about 15 percent of the stock, Smith’s hedge fund stood to benefit if the share price went up. Such buybacks are now common but controversial. Typically, they are done by companies flush with extra cash, which was not the case with Wausau. But the Wall Street audience was cheered by Smith’s buyback plan, as well as his call for the company to increase its dividend. As he spoke, the stock of Wausau Paper climbed upward. Smith followed up with a letter to Newell on Oct. 22, 2013, in which he said he found it “particularly troubling” that Newell “would like to prioritize growth,” at Wausau, charging that Newell had made “value destructive capital investments.” He urged Newell to commit “to returning a large portion of cash” to shareholders. He began one section of the letter with the headline, “Wausau Should Initiate a Buyback Now, then Increase its Dividend Substantially.” He tied the call for a buyback and dividend hike to the company meeting its own rosy financial projections — projections that did not pan out. Newell says he was stunned by the buyback proposal. He said that far from having extra cash with which to buy back stock, the company would have had to try to borrow money to pay for it. He said he needed the company’s cash to pay off the debt on the $220 million tissue-making machine in Kentucky, on which he had bet the firm’s future. For a while, Wausau stood by Newell, issuing a January 2014 press release that attacked Starboard’s plan to try to control the board. “We believe that it is disproportionate and inappropriate that Starboard — which holds only 15 percent our shares — should be able to designate the majority of the board,” Wausau wrote. But the activist investors won the day, and Newell resigned in April 2014. Shortly thereafter, Starboard successfully nominated Smith’s partner, Molinelli, to sit on the board and gained majority control. The circle was complete: In less than three years, Starboard had gone from being an obscure investor to controlling the board. During this tumultuous transition, mills were shut or sold. A chief executive was replaced. Starboard has high hopes that profits will grow and gives itself credit for righting the company. Those who lost jobs can only wonder whether it was due to structural change in the paper business, poor management, activist demands, or a combination. What is clear is that what happened to Wausau Paper is being echoed at many other companies as activism grows, for better or worse. Preston Athey, who managed the T. Rowe Price Small Cap Value Fund, one of Wausau’s largest shareholders at the time, saw the fight unfold. His fund was a longtime “passive” investor, making suggestions and anxious for better returns, but willing to be more patient to see if Newell could succeed. Wausau Paper, having sold its other two Wisconsin mills, no longer has any presence in the state aside from its headquarters. Smith has gone on to much glory on Wall Street. Forbes magazine calculated that his firm made a profit in 84 percent of its activist campaigns since 2002. One of Smith’s big successes came when his hedge fund purchased 5 percent of AOL’s stock and, after applying pressure on management to sell patents and other assets in 2012, the value of his shares soared 250 percent, according to a report by Fortune, which last year called him “the investor CEOs fear most.” Starboard was named the No. 1 activist of 2014 by the trade publication Activist Insight. Smith’s investment in Wausau Paper has not gone as well. He began accumulating significant amounts of Wausau stock around June 2011, when it was in the $6 range. It closed on Friday at $8.65. More than a year after Starboard won control of the board, the company has not done a stock buyback or raised its dividend. Smith has held on to the stock for four years, much longer than the short-term reputation of activists might suggest, and has continued to express confidence that the share price will go up. Newell, sitting at his home down-river from the Brokaw plant, said he is speaking out because the public should understand the impact that some activist investors can have on companies and communities. The case has prompted US Senator Tammy Baldwin, a Wisconsin Democrat, to call for restrictions on activist investors, which she said she will outline soon in legislation. She said she was “shocked” by Starboard’s criticism of Wausau for preferring growth over a $100 million stock buyback. “Part of what we should be looking at is the impact of decisions of the workforce, the impact on communities, and there’s no better example of that than the impact on Brokaw,” she said. Back in Brokaw, the village’s 248 residents struggle with the aftermath of the mill closure. The village’s sale of water to Wausau Paper had accounted for 95 percent of its revenues, which it relied on to pay for the water system. The village tried to make up some of the loss by raising taxes to three times the rate of neighboring municipalities, and the water rate to five times the nearby level. That hasn’t been nearly enough. 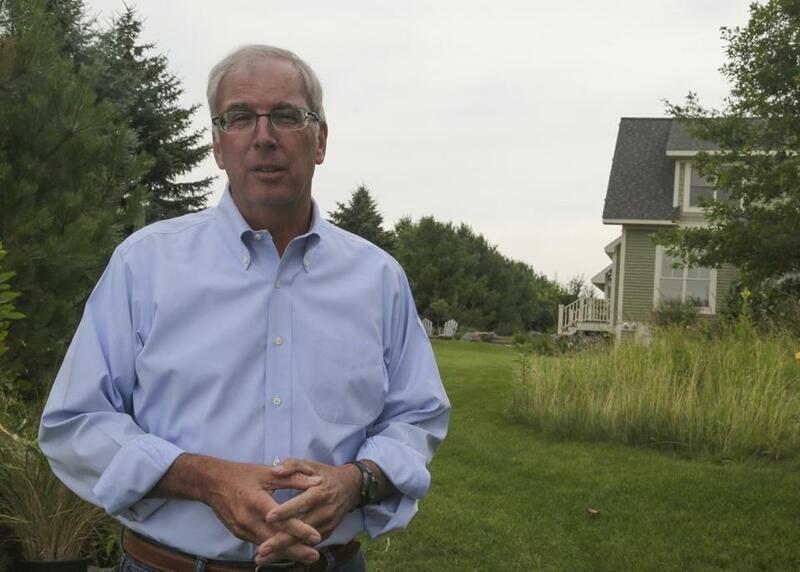 Weisenberger, in his role as village president, tried to declare the village bankrupt, but Wisconsin officials told him that wasn’t allowed under state law. Governor Scott Walker, a Republican seeking the presidential nomination, did not respond to a request for comment. An aide said a provision was included in the state budget that would allow Brokaw to be subsumed by two neighboring municipalities that would have to pay off its debts. In other words, Brokaw would no longer exist. Some longtime residents can’t accept the idea that their village might disappear. Across the street from the mill, the Frank family is working on a plan. For three generations, the family has sent its members to the mill, and they have been a fixture in Brokaw since the 1920s. Ruthelle Frank, now the 87-year-old family matriarch and a former mill employee, feels betrayed. “I don’t think anybody could appreciate what this little town was and what was destroyed,” she said. She recently heard of the website GoFundMe, which enables anyone to finance a cause. She talked it over with her husband, Henry, who worked at the mill for 38 years, and her children, Rochelle and Randall. “It’ll take YOU to save a VILLAGE,” the Franks wrote on the website. They set a goal they believe would enable Brokaw to avoid dissolving: $2.5 million. The response got local news coverage but, as of Friday, had raised only $756, much of it from the family. Ruthelle is trying to remain optimistic. Maybe, she said, there’s an investor out there willing to bet on Brokaw. Michael Kranish can be reached at kranish@globe-.com. Follow him on Twitter @GlobeKranish.